UPDATED, Feb. 27, 2011 — The Catholic Church announced Feb. 26, 2011, that Carlos Martín would be released and deported to Spain. Carlos Martín Gomez is a problem prisoner. Most recently, Martín was confined to a punishment cell at the Melena Dos prison, in Havana province. His sister told human rights activist René Montes de Oca Martija that prison officials were had denied Martín adequate medical care after a fish bone got caught in his throat, according to a report by independent journalist Roberto de Jesús Guerra Pérez, posted at Bitácora Cubana. Officials had taken Martín to a clinic in Melena del Sur, but they worried that he might incite other patients being held there so he was returned to the prison, according to his sister, Sabina Martín Gomez. She added that her brother has lost considerable weight while in the punishment cell and that he is only able to ingest liquids because of the problem with his throat. Cuba is a big prison which the regime has filled with prisons, poverty, famine and disease. The communist thugs have subjected us to this for 48 years. Hopefully, soon we will see freedom in the beautiful land of our birth, and that nobody has to flee, like the athletes and other personalities who have left. My greetings to all the brothers who listen to Radio Martí and other ways of learning about the truth about what is happening. I reiterate my affection, respect and love, from the No. 3 cell of the Melena del Sur prison, in Havana province, to all who in one form or another, struggle for the independence and freedom of Cuba. 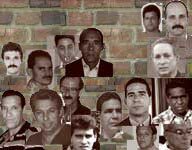 One of the surest indicators of the repressive nature of the Castro regime is the jailing of several hundred political prisoners. To illustrate that reality, Uncommon Sense each week profiles one prisoner. There also is a Political Prisoner archive on the right sidebar. To suggest a prisoner for a profile, send me an e-mail.